I’m using the WYSIWYG field inside the custom Gutenberg block registered with acf_register_block() and facing the next issue: when copy-pasting the content from the page into the editor (visual mode and text mode) I can see it in the editor: http://i.imgur.com/6bZO3yV.png, but the whole block (with all fields) isn’t outputted on the front-end. The template part with a block markup isn’t called (the debugger is initialized inside template only on the backend). The post_content has the block markup inside it with the content saved as a JSON. When I delete all links inside the WYSIWYG field, the content shows correctly. When I add links manually using link markup – content shows correctly. So my guess is that when copy-pasting the content in visual editor some chars are inserted that brake the JSON and block fails the validation (no clue about this on the backend though). 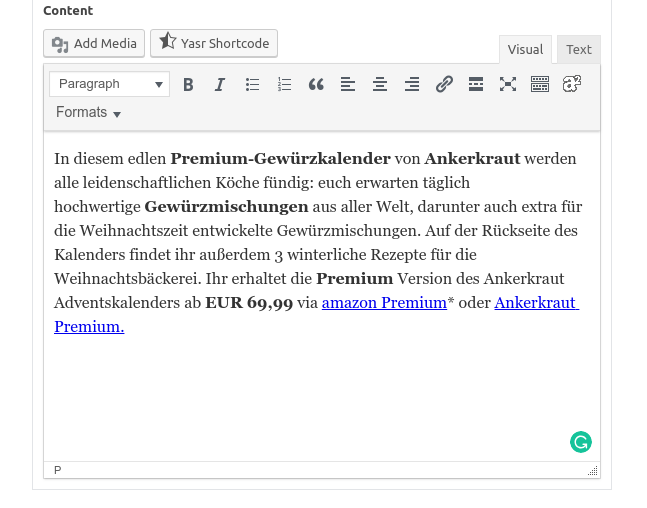 Is there a way to be able to copy-paste the content from a website into WYSIWYG editor without breaking the block? Found out that when you strip the extra link attributes, e.g. target=”_blank”, rel=”nofollow” from the link HTML in text mode, the block displays again.